Now that you have your Apple Watch, make sure you have the ABC7 Chicago News app to get real-time news updates and personalized alerts all right on your wrist. Apple CEO Tim Cook called the Apple Watch the company's "most personal" device yet and Eyewitness News is embracing that idea by delivering the stories that matter in your life. Tap the Circle 7 on your watch face and get a quick look at five stories happening at that moment. Force touch will allow you to read a summary right then and there or save the story to your iPhone for later. When news breaks, you'll see the Eyewitness News logo appear on the watch face. Hold it up to get the "long look" with important details and then see the full story on your iPhone. The world on your wrist without interrupting the moments that matter. Get the ABC7 Chicago News app with support for your Apple Watch and iPhone right now in the App Store. 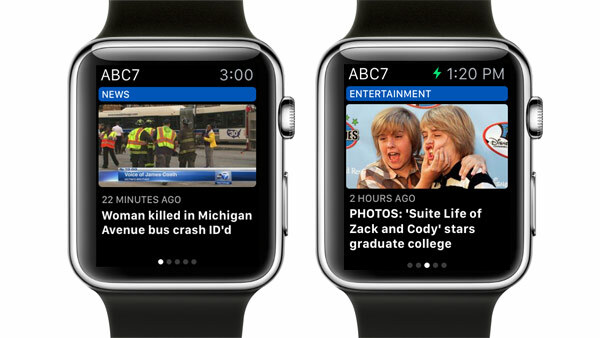 CLICK HERE to download the ABC7 Chicago News app with support for the Apple Watch.